THE Magnum 6K32TRC switch from Boston Technology provides rack-mount space efficiency in a free-convection-cooled unit (no fans) for heavy duty industrial applications where the presence of dust and dirt may inhibit normal cooling. * Internal heat barriers contain heat to areas where it is least detrimental. * Large copper power supply heat sinks to dissipate the power heat loss. * Aluminum case material used for efficient heat conduction & distribution. * Perforated case areas enable some vertical air flow via convection. * Cooling space above and below the unit in the rack, 1/2U top and bottom. * Multiple heat sinks distribute heat from internal electronic components. * Premium high-efficiency components used to minimize heat generation. The highest energy efficiency of any rack-mount industrial switch not only enables high reliability, but also makes the 6K32TRC a "green" environmentally friendly product. There are16 fixed 10/100Mb copper ports plus two configuration slots in the Magnum 6K32TRC. The modular slots provide the flexibility to configure up to sixteen 100Mb fibre ports, and/or some 10Mb fibre ports, and/or one to four Gigabit ports, or some more copper ports. Fixed gigabit and standard GBIC ports can be configured for a variety of Gigabit fibre and copper cabling types and distances. 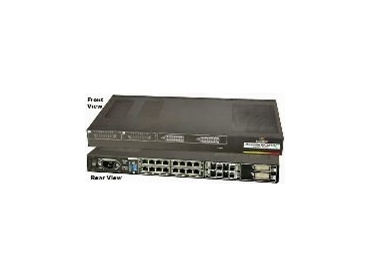 Magnum 6K32TRC managed switches come with LAN software support including SNMP management, Secure Web Management, IGMP, graphical user interface (GUI), redundant LANs support, and many network management security and ease-of-use features. Magnum 6K32TRCs are suitable for building a switched industrial network in applications connected to communications computers, routers, hubs, or other switches. Designed for use in heavy-duty Ethernet and Industrial networks with segments requiring multiple Gigabit backbone interconnections among network centers, the Magnum 6K32TRC is easy to install and operate. The switches have rugged metal cases and auto-ranging power supplies for operation with standard ac power worldwide. Internal dc power supplies are optional.